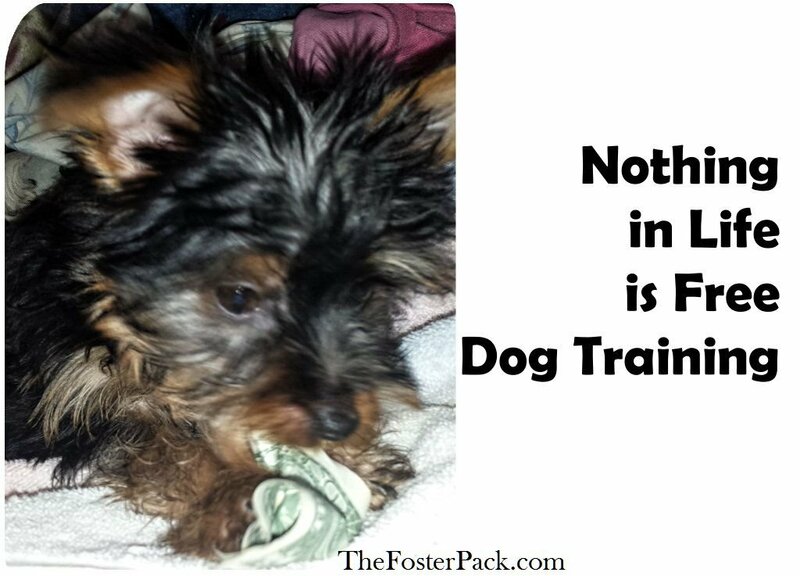 Have you heard of the Nothing in Life if Free method of handling or shaping your dog’s behavior? If not then you really should look into it. It’s great for changing the way your dog behaves. It helps to stop him scratching at your leg while you’re otherwise occupied. Stops the begging. It can help with resource guarding, aggression and a whole list of other less than desirable dog behaviors. So what is the Nothing in Life is Free (NILIF)? Humans, at least humans of adult ages, know that you have to work for everything you have in life. Or they should know that by the time they’re adults. And the idea is the same for working with your dog. The Nothing in Life is Free method of training is very simple. You have the things your dog wants. So make him earn them. When he does what you want, you reward him with the things he wants. Such as attention, food, treats, toys, etc. Some people call it “No Free Lunch” or “Say Please”, but the idea is the same. Why use Nothing in Life is Free? Making your dog work for everything he wants is a great, safe, positive, and non-confrontational way to establish yourself as the leader. Even if your dog shows no aggressive behavior, he can still manage to manipulate you. Such as forcing his way onto your lap for snuggles and attention. By using the NILIF technique it reminds him that he must follow your rules. All of the time. It’s also great for helping to stop resource guarding. As they have to work for each resource, and in a multi-dog household, everyone has to work for it. It’s also great for working with insecure dogs to build their confidence. As they earn each item, it helps to build their confidence. Which leads to them feeling more comfortable, secure and less stressed. It helps with lots of minor behavior problems too. Dogs want things, and if they only get those things by doing what you ask, they’re going to do it. Good leadership encourages good behavior. The NILIF helps to provide the boundaries and guidance that your dog needs. How to get started with the Nothing in Life is Free? Hopefully, your dogs already knows at least the ten basic dog commands. And maybe even a few more commands and tricks. If so, then you’re ready to begin. If not, you really should work on a few of the basic commands first. Once your dog knows at least sit, then you can begin with the Nothing in Life is Free. So stop giving him the things he wants for free, and make him work for them. Stop giving treats, attention, food, walks, playtime, etc. until he has earned them. How does he earn his resources? By performing at least one basic command, or other trick he knows, before he gets anything. Even a pat on the head. You don’t always have to make him do the same thing or things for each resource, mix it up a little. But at least make him perform at least one basic command for everything he gets. Such as, if it’s time for a walk, make him sit and stay until you get his leash or harness on him. If it’s feeding time, make him sit and wait for his bowl. Or we make Jackyl dance for his dinner. He’s the only dog in the house that dances on command. Playing a game of fetch? Make him sit or shake for each time you throw the toy. Does your dog want some attention? Make him lay down, and if he knows it, roll over for some belly rubs. Just make sure that once you’ve given the command, you don’t give him what he wants until he does what you’ve asked of him. Wait him out. If he’s being stubborn, be patient and remember that he will eventually obey you to get what he wants.